Like the Venn diagram tool, this tool identifies differential overlaps between input identifier files and outputs a tab-delimited text file containing the original file contents for intersecting (Intersection option) or all combined IDs (Union). For this analysis, species and platform selection are not important. Up to four files can be selected for overlap. An output directory must also be selected for which to save the combined output (MergedFiles.txt) to. All columns contained in the original files will also be in the output with the column names followed by the source file (column-name.source-file.txt). From the AltAnalyze main menu, select your species and platform. Instead of indicating the platform you can also select "Other ID" as the data type and the gene system you are analyzing as the "platform ID". 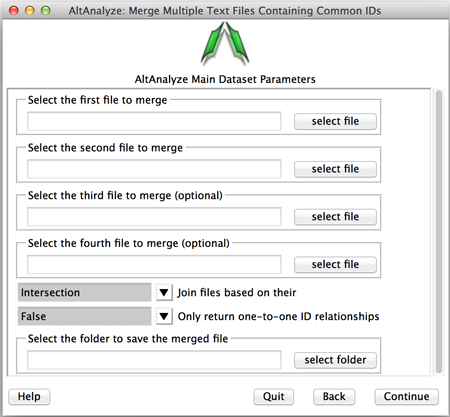 Select Continue and then Additional Analyses. From here, select Merge Files to see the options for loading your input ID list. Additional options are available for only returning unique IDs for each file or all possible combinations of matching IDs in the output (important when more than identical ID is present in the first column of a file).